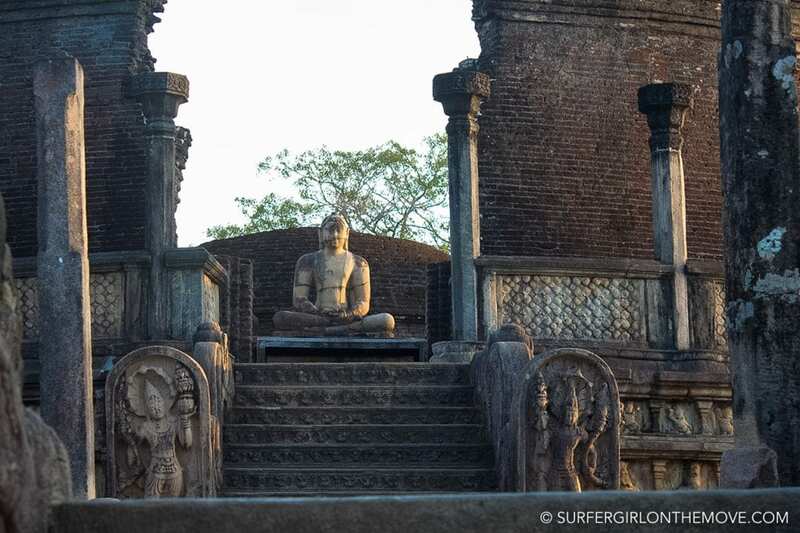 Polonnaruwa was not on the list of places to visit when I first boarded to Sri Lanka. 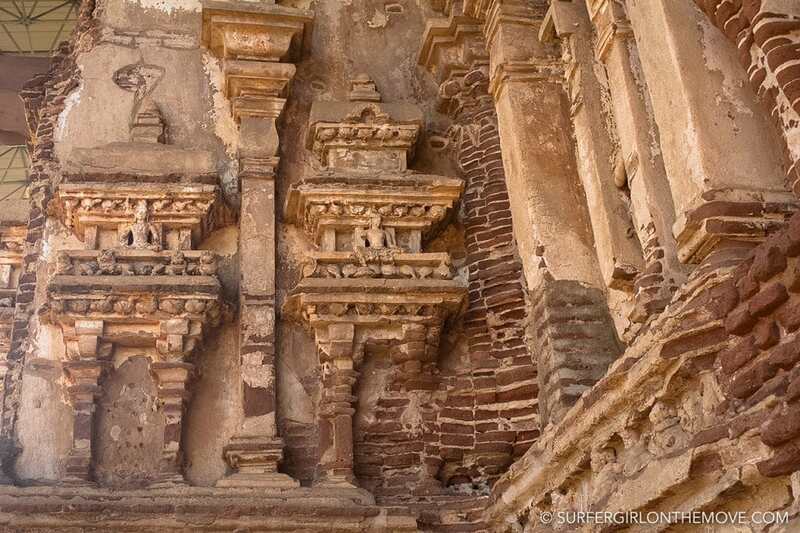 I had in mind to go to the Dambula Cave Temple or climb Sigiriya, but I had never heard of this city, nor of its importance to the history of the country. 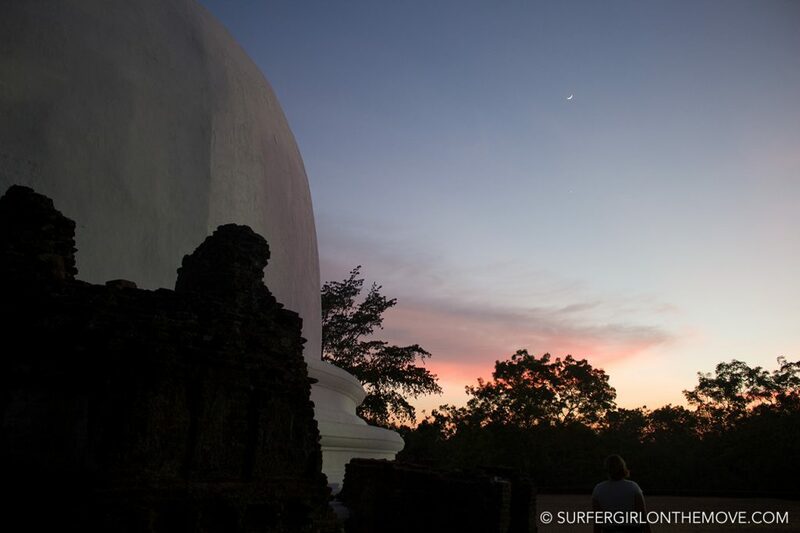 But when we were on the coast, ready to head north, we decided that we had time to make the detour to Polonnaruwa. Maybe one of the best decisions we made. 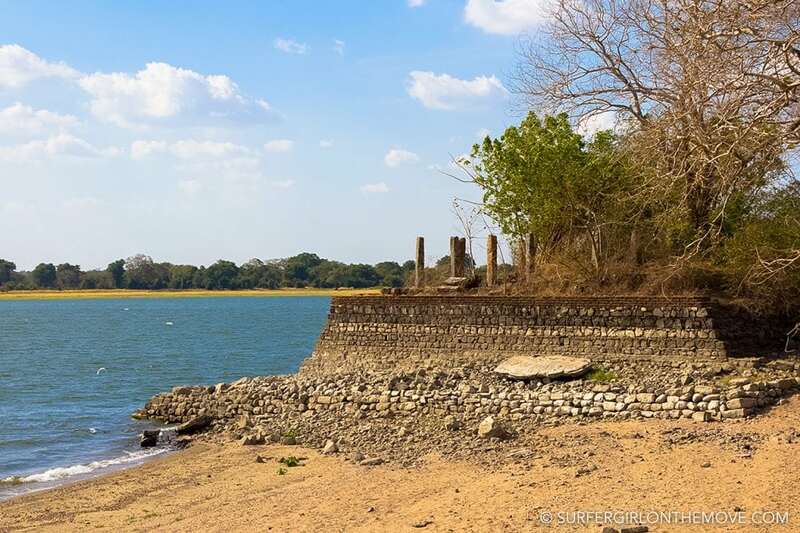 We drove for four hours from Arugam Bay to Polonnaruwa, most of the time on the road that runs along the shoreline. The proximity to each big city always brought traffic confusion, but as soon as we drove away, driving became more quiet and safe. 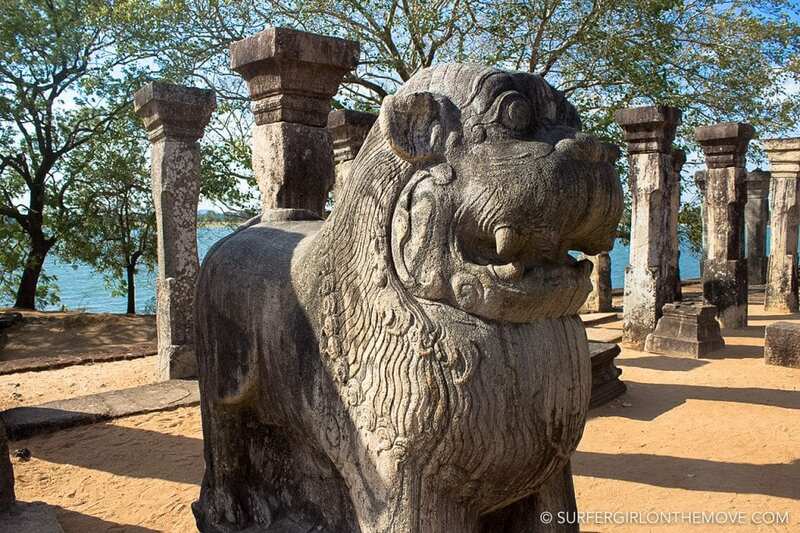 For three centuries Polonnaruwa was the capital of the country, from where kings ruled from a privileged position in the center of Sri Lanka. The city reached its apogee during the reign of Parakramabahu I (r. 1153-86), which ordered the construction of large buildings and beautiful parks. 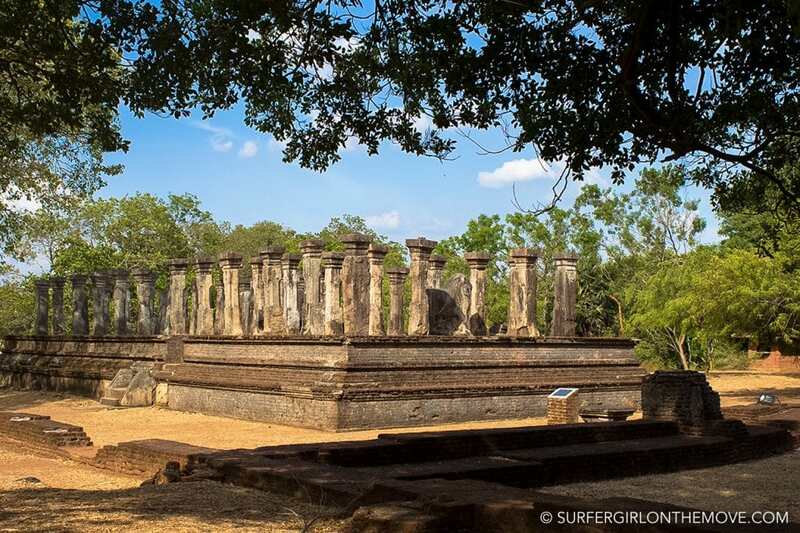 But it was from the 13th century, when the governance center moved to the west side of the island that Polonnaruwa was left to abandon. Today, for what it represents for the history of the country and the wonderful state of conservation of the ruins, UNESCO classified the place as a World Heritage Site. 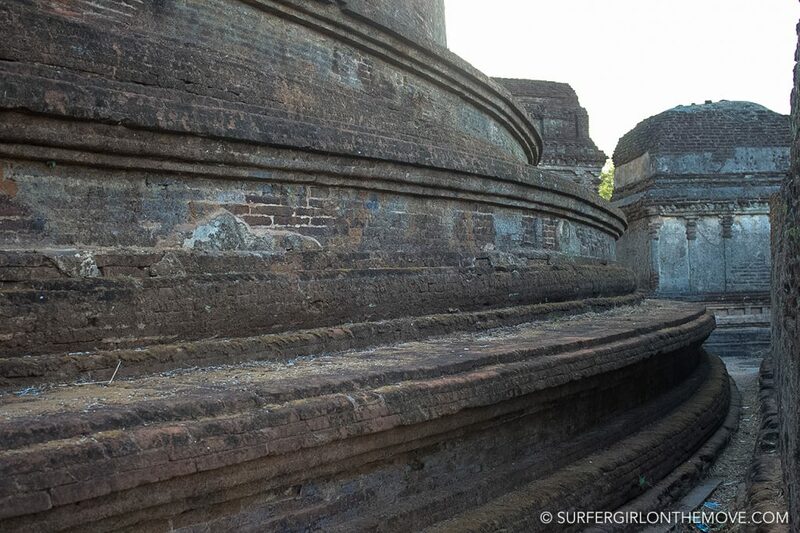 The area covered by Polonnaruwa is still quite extensive, dividing into different cores. To see them all, the ideal is to spend the day here. But because you still have some distance to go, you can always rent a bike or, as in our case, a tuk-tuk. 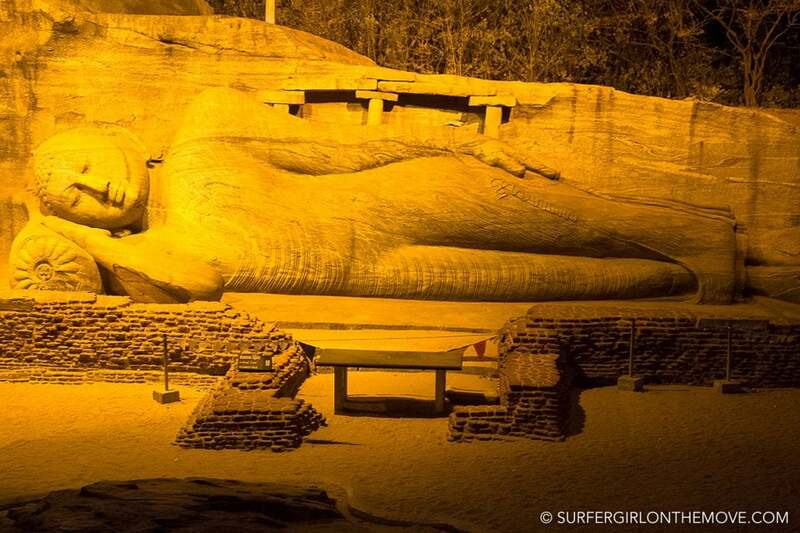 The Statue of Parakramabahu … or is it not? 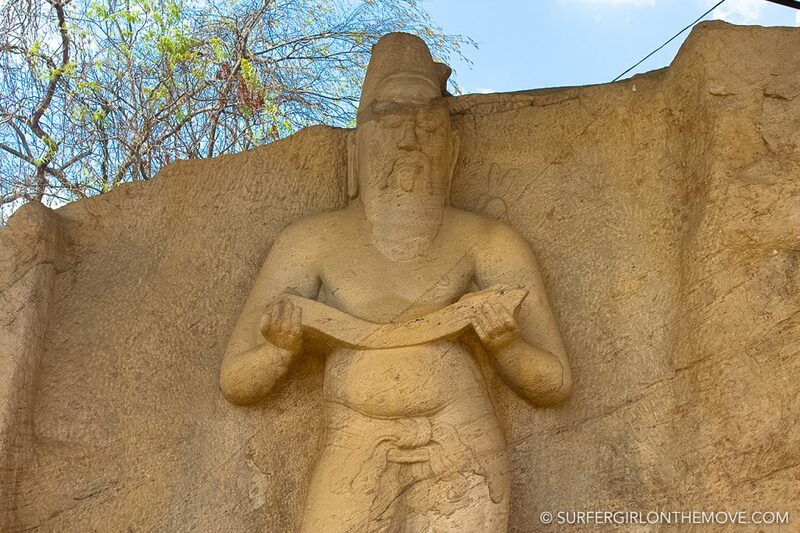 We started our walk along the statue of Parakramabahu, right at the entrance to the archaeological park. Many ascribe the image to the king, although others argue that because of the object in his hands, possibly a manuscript, he is a scholar, possibly Pulasti, Agastya, or Kapila. A few meters from the statue we entered the grounds of Potgul Vihara, the remaining of a library-sanctuary. If so, it may well be the oldest librarian complex in all of Sri Lanka. There we continue by tuk-tuk towards Deepa Uyana (also known as the Garden Island). 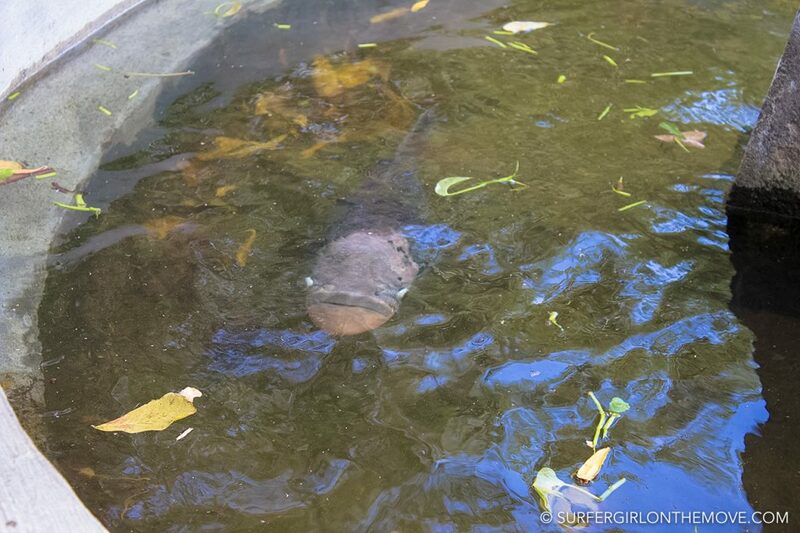 Located right in front of The Lake House (where we were told that one day the Queen of England was hosted), our driver made a point of introducing us to one of the oldest hosts of the place: a large fish that lives in a lake right at the entrance of the archaeological site and that’s not shy to the cameras. 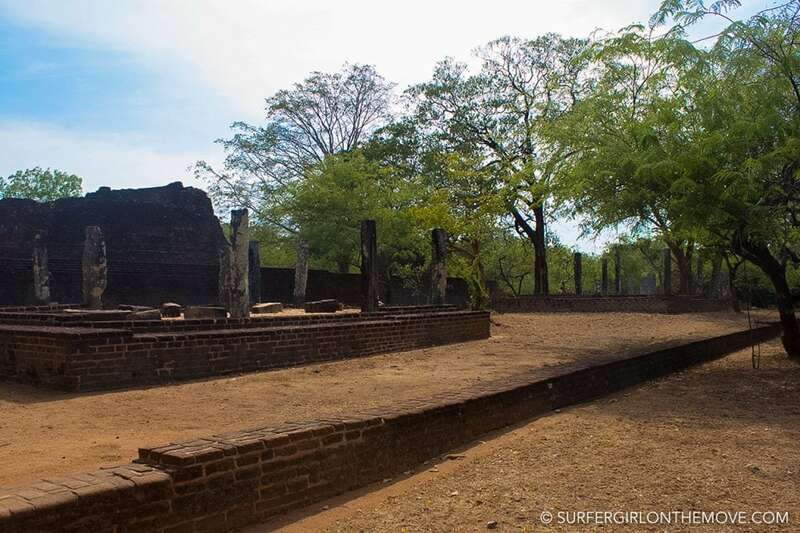 In this nucleus we found the ruins of important monuments, among them the Council Hall of King Nissankamella (1187-1196). Also here we visited an extensive bathing complex and enjoyed the ruins of the Summer House, bathed by the waters of the great lake. The figure of the lion, in the Council Hall, was the throne of the king, according to inscriptions in its belly. While on the pillars, other records show the seats of ministers and state officials. 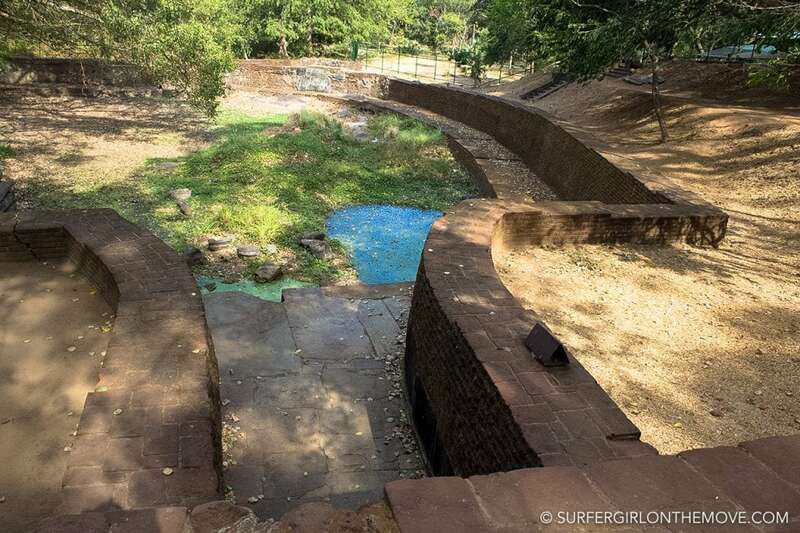 Of course, a site like these, full of important archaeological finds, has a museum where you can better understand the history behind Polonnaruwa. 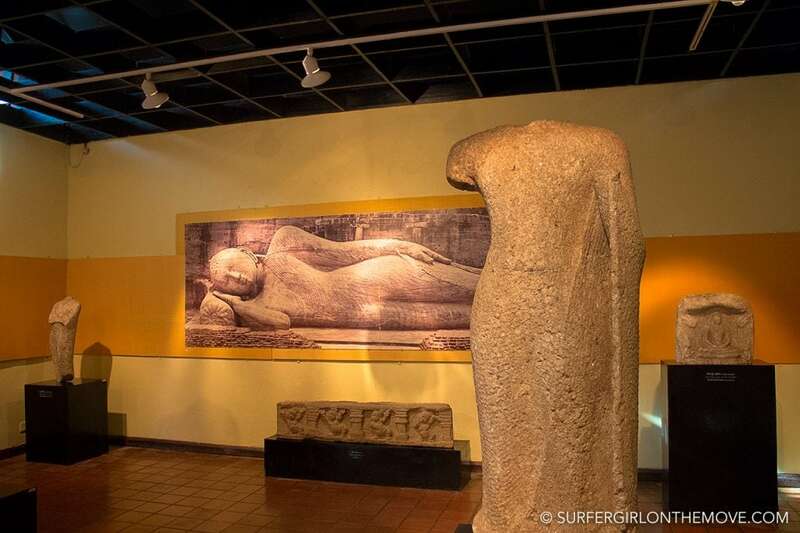 Each room in the Archaeological Museum of Polonnaruwa is dedicated to a theme, from the citadel, to the surroundings, through the area of ​​the monasteries and the main Hindu monuments. Here, too, we could spend a good deal of time, enjoying every object exposed, but in light of what we had yet to do, we made a quick visit. Our driver in fact took the role of guide and by this time already decided what we were going to see next. My fear of losing light and not being able to take some photos of the place made me nervous, but, , “the man must know what he’s talking about,” I thought. Returning to the road, he led us to Thivanka Pilimage, a temple that holds a Buddha about 8 m (or at least what remains of him). 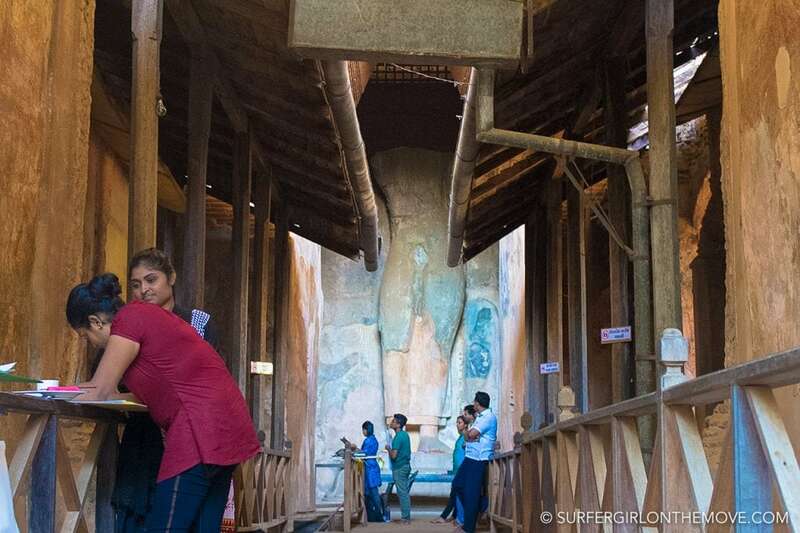 The place was also known for the paintings founded on the walls, many depicting stories of Jataka. 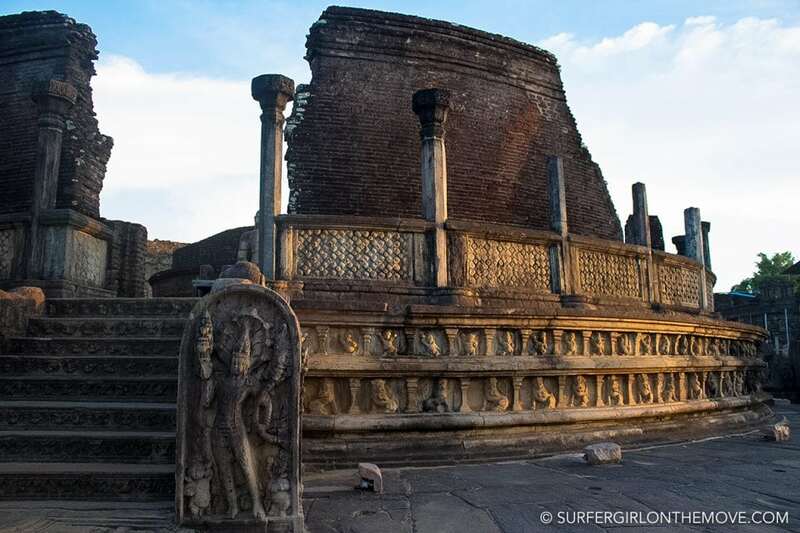 These are some of the best examples of Polonnaruwa murals. What I found extraordinary was to find a space filled with students of art who replicated on paper the images of the walls. The rush continued, passing through other smaller, but not less important, landmarks. Nelum Pokuna or Lotus Pond stands out for its shape. It belongs to the monastery of Jetavanarama, built by King Parakramabahu. 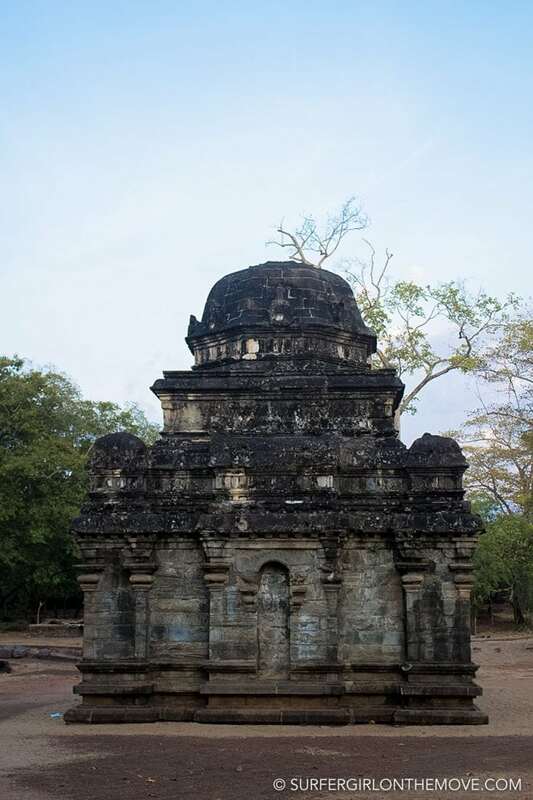 We were also at Siva Devale 2, which our driver pointed out as being the oldest Hindu temple in Polonnaruwa. He wanted us to take a picture in front of it, saying that couples usually visit this temple to ask for prosperity for the future. Who are we to go against tradition? Don’t give up on me yet! 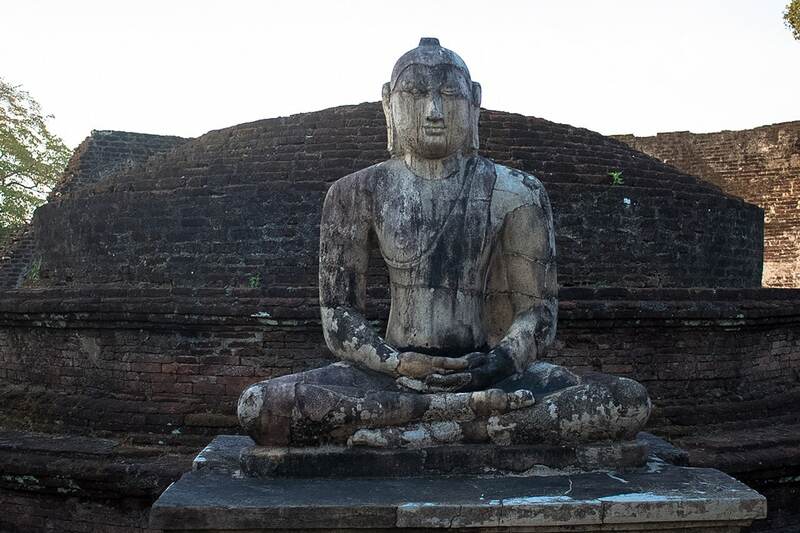 I warned from the beginning that Polonnaruwa is vast, but at every corner we cross path with more buildings and extraordinary places. The Quadrangle is another one of those places. 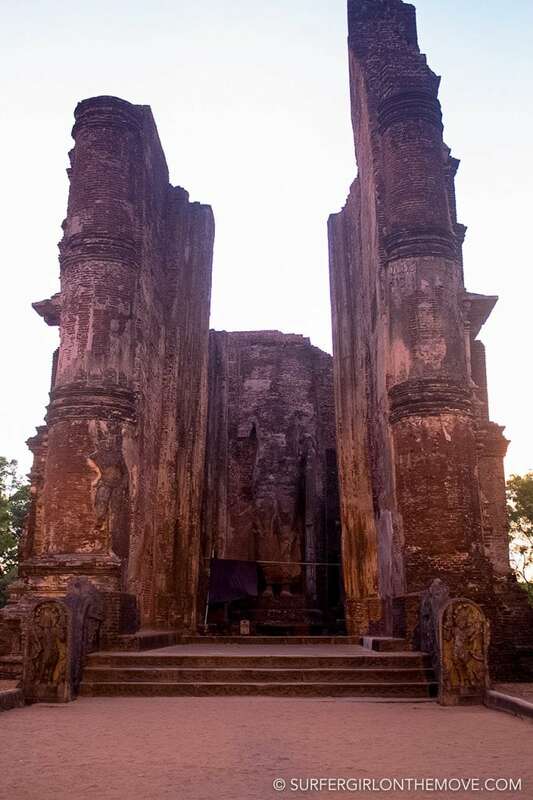 The name comes from the format of this complex with a compact set of ruins, like Vatadage, of circular format, with a stupa guarded by four statues of the Buddha. Time was running and the end of the day was getting closer, but there was still so much to see. 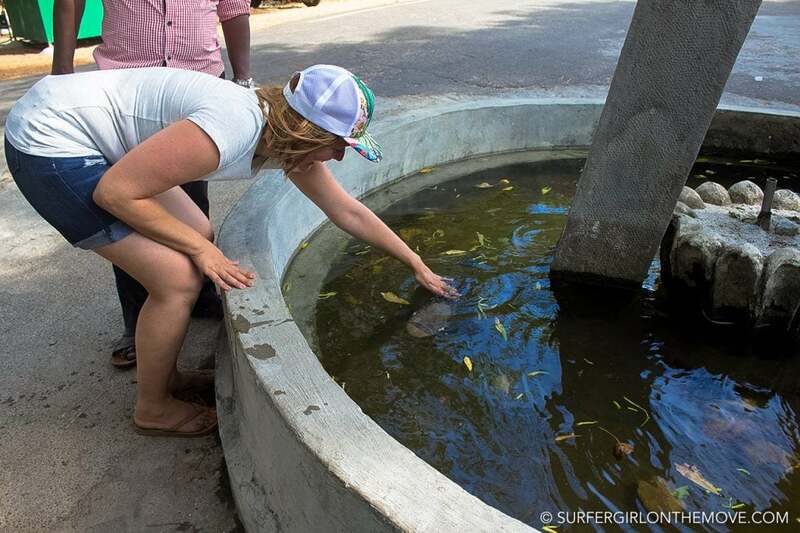 The size of these next monuments leaves anyone breathless. First, Rankot Vihara. 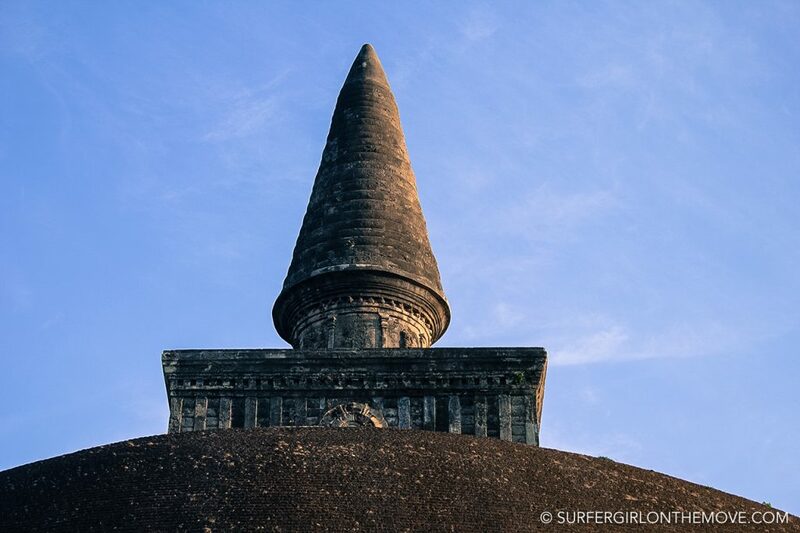 With its 54 m high, it’s the largest dagoba in Polonaruwa and the fourth largest in the whole island. 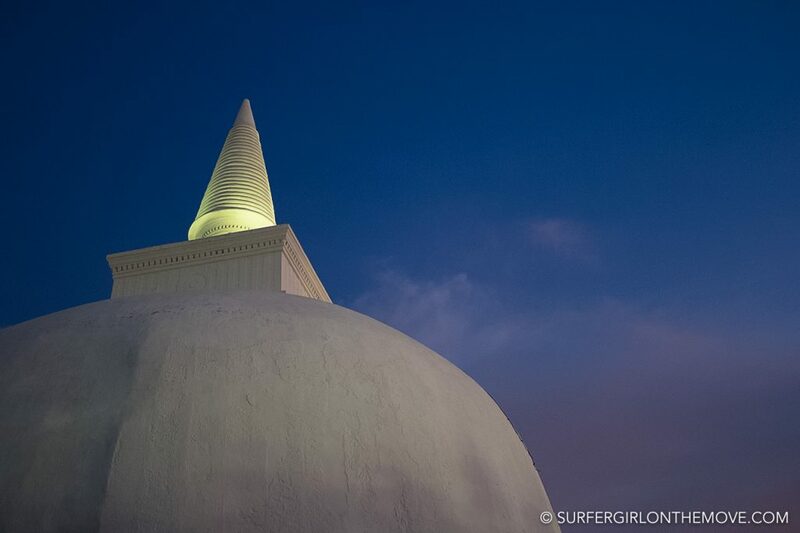 After that, we went to Kiri Vihara, whose name means “milk white”, and for its color stands out in the landscape. 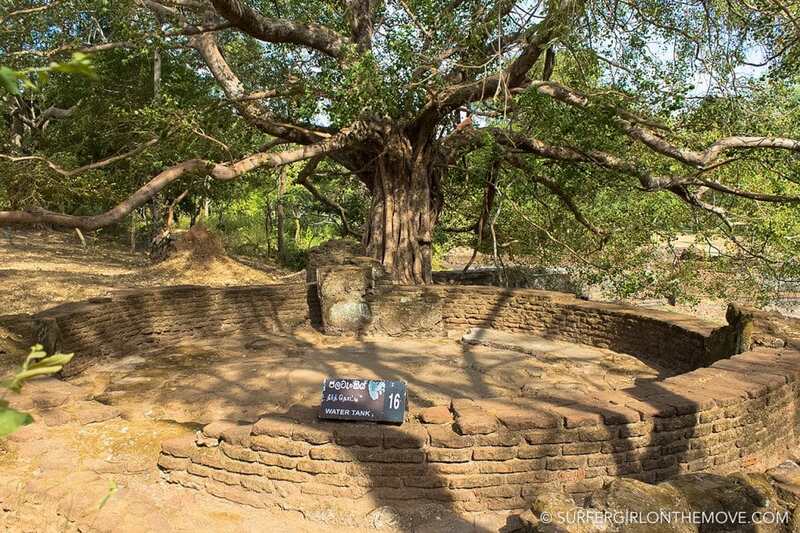 Swallowed by the local jungle for more than 700 years, it was found in perfect condition and is today one of the best preserved dagobas of Polonnaruwa. 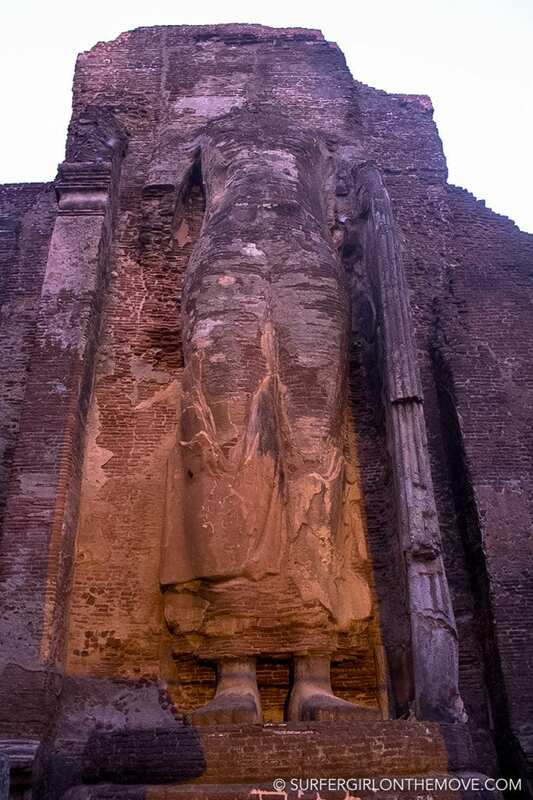 Finally, the imposing presence of Lankatilaka continues over time, even though its roof has already collapsed. I would have liked to see this cathedral better, but by this time the sun was already hidden and we still had one last place to visit: Gal Vihara. 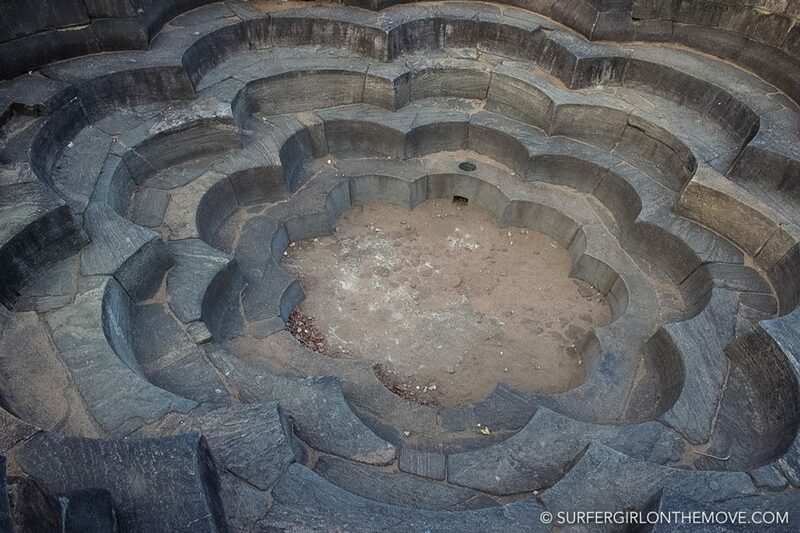 All my impatience to visit this place was from the images I had seen … and it didn’t disappoint. 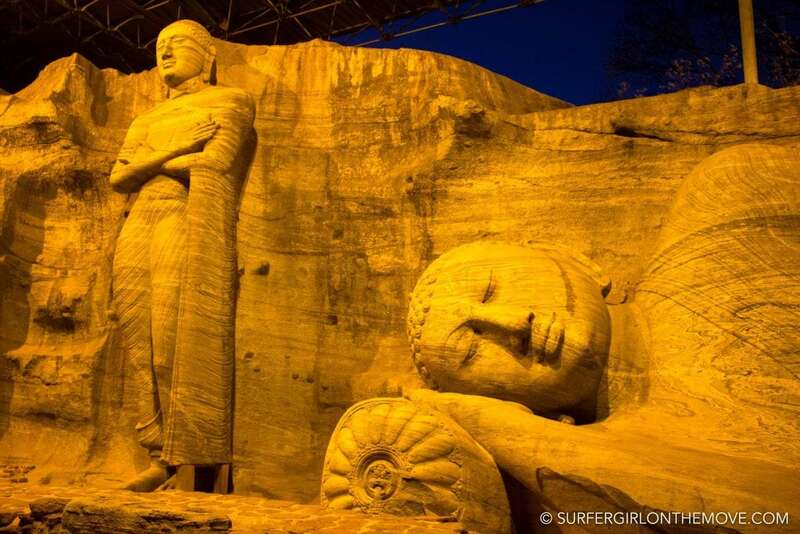 Gal Vihara has four imposing statues of the Buddha that represent all the art of stone carving done by the Sri Lankan people. And I’m not talking about small pieces. 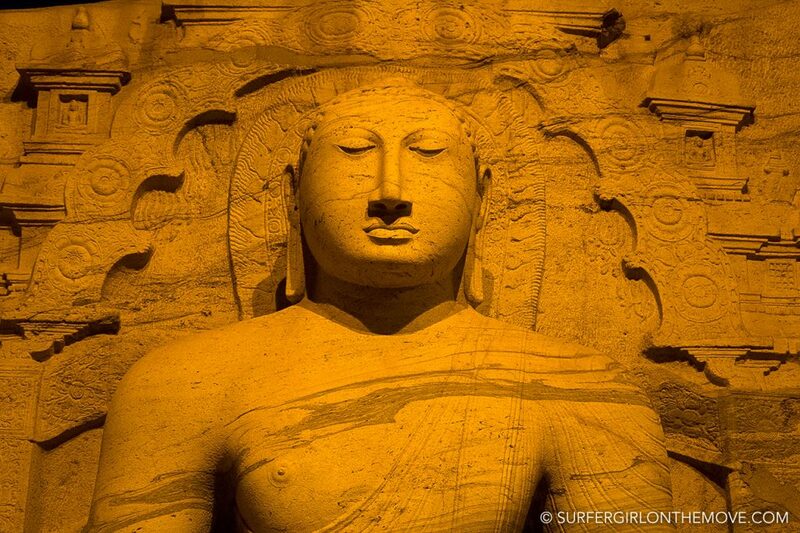 From the standing Buddha with 7 m, or the lying Buddha, 14 m in length, the magnificence of these statues makes us feel very small. 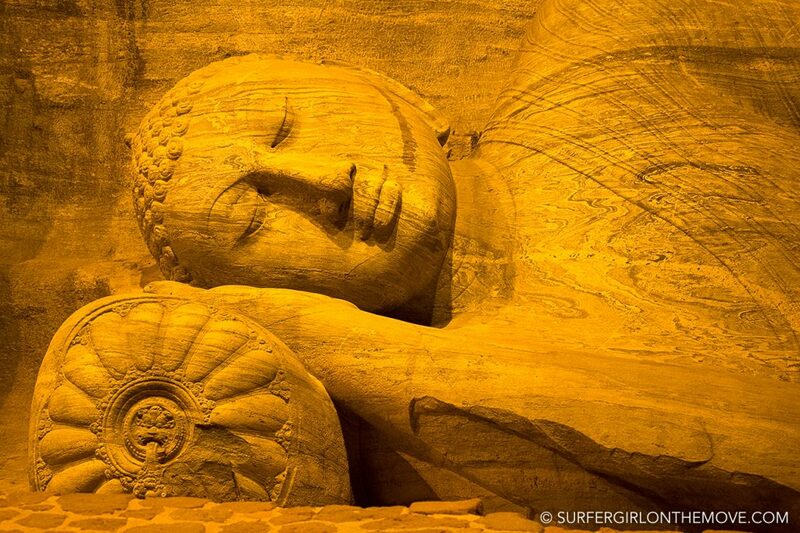 And, yes, our driver was right: at night, these Buddhas gain another magic. 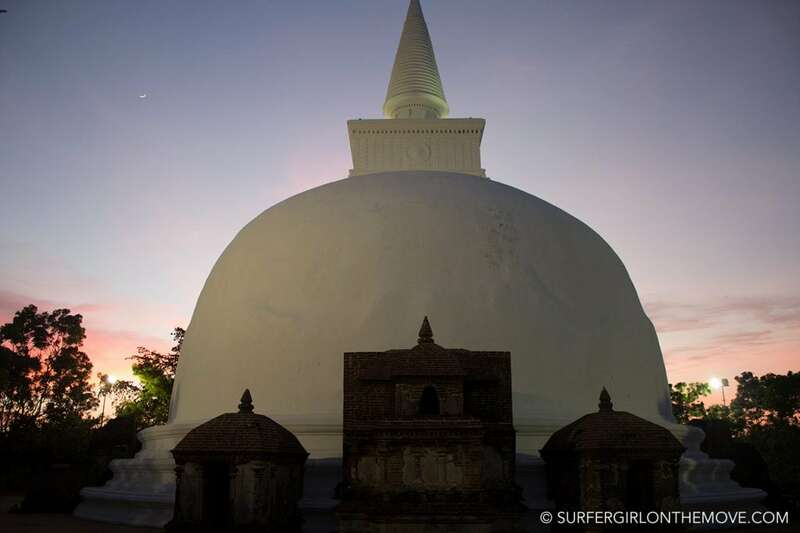 The night we spent in Polonnaruwa we stayed at Leesha Tourist Home. This is a fairly simple place by the roadside; so don’t expect much. 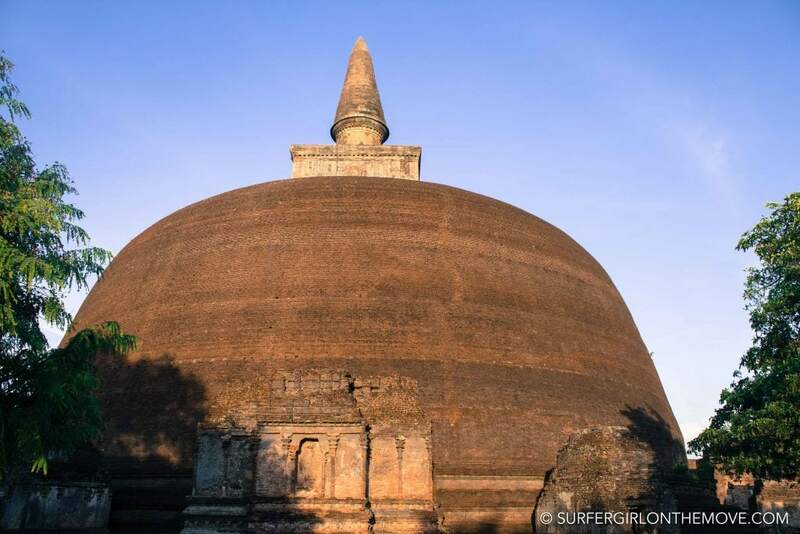 The owner received us with sympathy, offering us a lot of information about the place and putting us in contact with the driver who accompanied us on the visit to Polonnaruwa. There’s not a great deal of restaurants around town, but as we arrived we saw a place called Chili’s that looked good to us. It has a wide variety of local food, including non-spicy dishes (which by now was a blessing). We paid about 1,500 LKR per meal here. 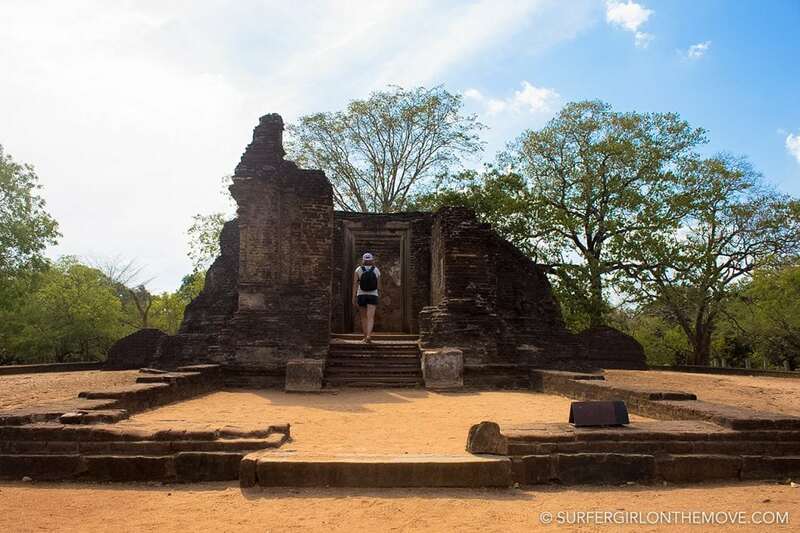 What did you think of Polonnaruwa? From what you read, what’s your favorite place? Share with me in the comment box below.